Seeing as the Cossack gearbox didn't like the BMW engine I decided to use the BMW gearbox. Oops - the drive shaft comes out directly in line with the swing arm. Right. Cut the swing arm off and fit a reliant axle. 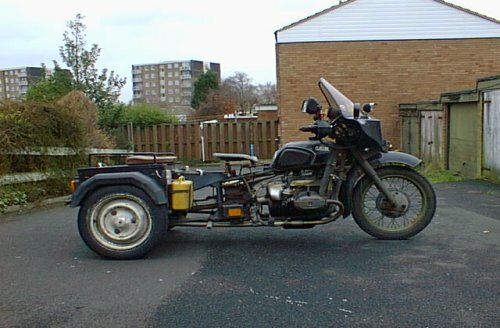 Having done this I took the G.R.I.M ( Grotesque Russian Industrial Motorcycle ) trike down Dorset for my 40th birthday. It ran well, if a little under geared. A set of fifteen inch Citroen wheels soon fixed that. The braking was much improved by fitting the front end from a Honda CX 650. Not long after this I was offered Striker's old trike, and at the same time a good friend of mine, Claws, was looking for a trike. I sold GRIM to him - he was well pleased. 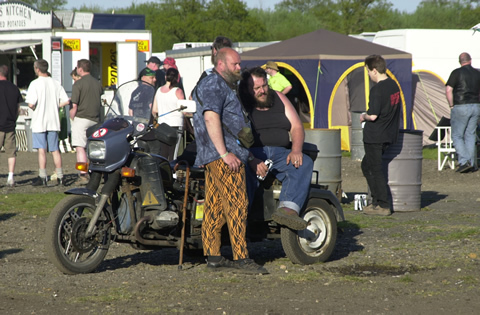 May 2001, and the NABD's national rally, held at Santa Pod raceway. Here's me and Claws sitting in the sunshine. 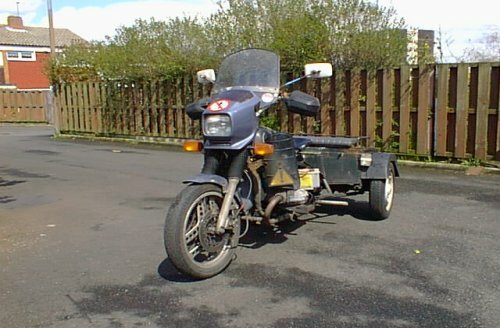 Claws had been involved in a serious accident whilst riding his Enfield Bullet, and a trike was the ideal machine for him. After such bad luck, things were looking up for Claws - he had just moved into an adapted bungalow and was due to get married in September. . . . . . .sadly this never happened. In June, a car turned right across his path, killing both Claws and GRIM. Not a good day.